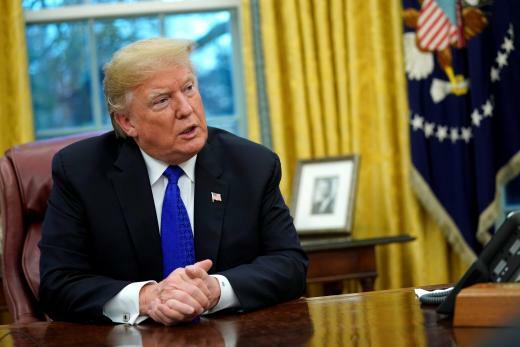 House Democrats eye reported FBI probe of Trump - SABC News - Breaking news, special reports, world, business, sport coverage of all South African current events. Africa's news leader. A US House of Representatives committee will look into a newspaper report that the FBI investigated whether President Donald Trump has been working on behalf of Russia, against US interests. A US House of Representatives committee will look into a newspaper report that the FBI investigated whether President Donald Trump has been working on behalf of Russia, against US interests, the panel’s Democratic chairman said on Saturday. The New York Times reported that the probe began in the days after Trump fired James Comey as director of the Federal Bureau of Investigation in May 2017 and said the agency’s counterintelligence investigators had to consider whether Trump’s actions constituted a possible threat to national security. Trump rejected the Times piece in a late Saturday night interview on Fox News as “the most insulting article I’ve ever had written” and lashed out at Comey and the FBI in half a dozen tweets. “There is no reason to doubt the seriousness or professionalism of the FBI, as the president did in reaction to this story,” Nadler, a New York Democrat, said in a statement. “We have learned from this reporting that, even in the earliest days of the Trump administration, the president’s behavior was so erratic and so concerning that the FBI felt compelled to do the unprecedented – open a counterintelligence investigation into a sitting president,” Nadler said. House Intelligence Committee Chairman Adam Schiff said he could not comment on the specifics of the report, but said his committee would press ahead with its probe of Trump’s contacts with Russia. “Counterintelligence concerns about those associated with the Trump campaign, including the president himself, have been at the heart of our investigation since the beginning,” said Schiff, a California Democrat. Schiff said meetings, contacts and communications between Trump associates and Russians, as well as “the web of lies about those interactions, and the president’s own statements and actions,” have heightened the need to follow the evidence where it leads. The New York Times said FBI officials became suspicious of Trump’s ties to Russia during the 2016 presidential campaign, but held off on opening an investigation until Trump tied his dismissal of Comey to a probe into allegations of election meddling by Russia. The FBI also considered whether the Republican president’s firing of Comey amounted to obstruction of justice. US Special Counsel Robert Mueller took over the investigation into Trump days after the FBI opened it, as he examined allegations of Russian election interference, the Times reported. Russia denies it sought to influence the election. Trump lashed out at the Times and former FBI leaders, and criticised the agency’s earlier probe of Democrat Hillary Clinton, his rival in the 2016 election. “Wow, just learned in the Failing New York Times that the corrupt former leaders of the FBI, almost all fired or forced to leave the agency for some very bad reasons, opened up an investigation on me, for no reason & with no proof, after I fired Lyin’ James Comey, a total sleaze!,” Trump tweeted. This entry was posted on 13 Jan 2019,11:33AM at 11:33 AM and is filed under World, Homepage Featured Story Slider. You can follow any responses to this entry through the RSS 2.0 feed. Both comments and pings are currently closed.